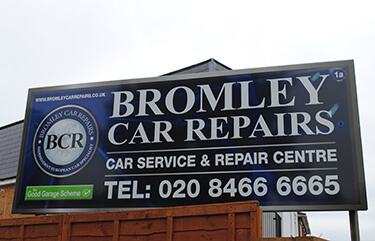 Bromley Car Repairs was established in 2007, specialising in Audi, Volkswagen, Seat, Skoda (known as the VAG Group) and BMW Mini, carrying out all vehicle servicing, car repairs and MOT testing to manufacturer's specification using the latest diagnostic equipment and the best tools for the job. We provide a garage customer service like no other in Bromley. Our reception staff will be happy to deal with any enquiry you may have, whether it's making a booking, or some information or advice. We have a clean, warm waiting area with free tea and coffee, and free Wi-Fi. Our goal is to exceed your expectations with a hassle free service and outstanding customer care. We pride ourselves on having a 5 star Good Garage Scheme customer satisfaction rating. In April 2015, we acquired a second workshop known as Amos & Rushbrook on Masons Hill which is where the main service reception and MOT waiting area is now located. This has proven to be of great benefit to our customers as we now have 6 work bays and twice as many staff, minimising the time your car is off the road. Our main reception, workshop & MOT station is based at: 151 Masons Hill, Bromley, BR2 9HW and we have a second workshop at 1a Napier Road, Bromley BR2 9JA (Off Masons Hill) with easy parking. The Good Garage Scheme. Good for everyone! The Good Garage Scheme is fantastic! Being a member means we have a real source of independent customer feedback, without prejudice. You simply recommend who's good at what they do, from the customer service you receive to the work carried out, The Good Garage Guide has a great reputation for telling home truths about Garages and their overall performance. Take a look at what people say about us! At Bromley Car Repairs, we specialise in Skoda servicing, repairs and maintenance for the full range. We use OE parts for all of our work and we offer a 2 year guarantee on all work undertaken. We provide the same standard and quality of service you would expect from a Skoda service centre, with savings of up to 50% on dealer prices. As an independent garage, we can offer Mini servicing and repairs at an affordable price. We offer 2 year guarantees on all work undertaken and we only use authentic Mini parts, so you can trust Bromley Car Repairs to take care of everything from regular servicing to urgent repairs. 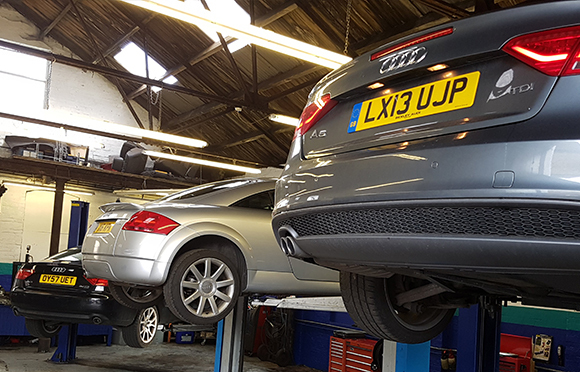 Bromley Car Repairs are an independent specialist Audi garage, able to offer main dealer Audi standards at affordable independent prices. We use only OE parts and work on all vehicles in the Audi range, from the modest A1 through to the powerful Q7. We are Bromley’s leading independent Volkswagen specialists. A Volkswagen garage offering VW repairs and servicing for all models, with up to 50% savings on dealership prices. We use original Volkswagen parts and specialise in DSG gearbox oil & filter changes, DPF changes, and cambelt replacement. If you’re looking for a Seat garage for servicing, cambelts and repairs of all Seat models, without main dealer charges, Bromley Car Repairs is the answer. We use original equipment and offer a 2-year guarantee on all work undertaken. Whether you have an Mii or an Alhambra, no job is too big or too small. Bromley Car Repairs offer BMW repairs and servicing for all models, including BMW 1 Series, 2, 3, 4, 5, 6 and 7 Series. We also offer servicing on performance models and the M ranges. We are able to offer all manner of repairs, including clutch repairs, brake testing and exhaust repair to mention a few.